Fly Emirates from Prague to Cambodia for 13 590 CZK. This attractive offer is applicable on flights booked until 16th June for departures between 30th June and 14th Dec 2017. Emirates today announced a special fare offer of 13 590 CZK round trip from Prague to Phnom Penh, Cambodia. This new route, which launches 1st July services Phnom Penh via Yangon and will enable passengers to travel between the two cities, broadening Emirates extensive route network in South East Asia and marking the only direct flight service between the two cities. Cambodia is emerging as one of the most sought after South East Asian tourism destinations for Czech travellers. Known for its ornate culture and delicious street food, Cambodia offers tourists the experience of stunning landscapes, local eateries and breath-taking historical sights. 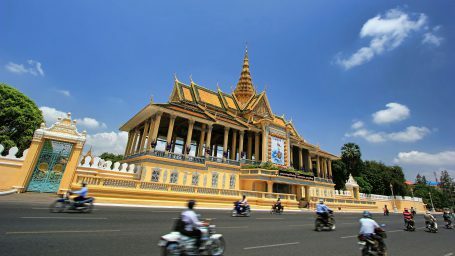 Phnom Penh is located in the south-central region of Cambodia and is only five hours from the World Heritage Site Angkor Wat, the largest temple in the world. Other remarkable sights to visit include ancient ruins like Bayon Temple, Ta Prohm and Banteay Kdei. For backpackers and families alike, there’s no shortage of things to do in Cambodia. If you would like to expand your journey, Phnom Penh is the perfect starting point to discover neighbouring destinations such as Siem Reap, Luang Prabang, Ho Chi Minh City and Bangkok. Phnom Penh is Emirates’ newest destination, joining 12 other South East Asian cities on the Emirates network. The new Dubai-Yangon-Phnom Penh service will enable passengers to seamlessly travel between Yangon, Phnom Penh and beyond. Passengers on Emirates flights enjoy gourmet, regionally inspired cuisine prepared using the finest ingredients. Flying with Emirates also means you can look forward to the award-winning inflight entertainment, ice, with more than 2,500 channel as well as a generous free baggage allowance of up to 35kg in Economy and 40kg in Business. For more information on special fares or booking procedure go to www.emirates.cz.